Dr. Hauschka Lip Care Stick – $12.59 (or less) for .17 oz. 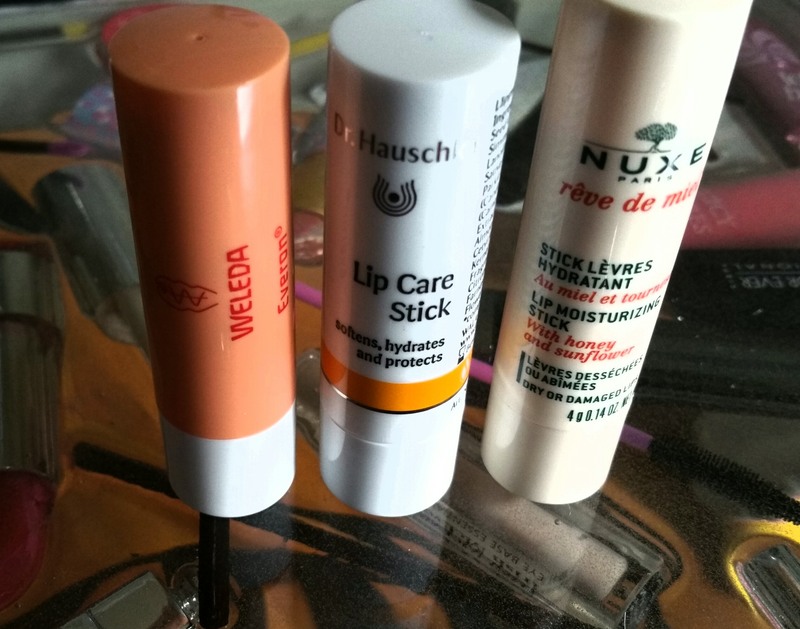 Weleda Everon Lip balm has been popular in my purse lately, after I recently rediscovered it. I also have a history with Nuxe Rêve de Miel lip balm, but with the one in a jar. As for Dr. Hauschka Lip Care Stick, it was my “go-to” balm during my stressful, second year in law school when I became ultra sensitive to everything on my skin and had to shop for cosmetics at Whole Foods. I also used and adored the Dr Hauschka Lip Balm (jar)– jar version. When I was later diagnosed with celiac disease, I assumed that I could no longer use Dr. Hauschka’s balms because they contained wheat germ oil (it looks like the Lip Care stick does NOT, so the ingredients were either changed or I was mistaken). I’ve come to believe that wheat germ oil is not a concern for me because the gluten is refined out to make oil. So, as I was selecting balms for this series, I determined that Dr. Hauschka Lip Care Stick and I could again be friends. I was so excited to have it back! Note that today’s three balms are similar in size and price range (using the Amazon Prime pricing available while I’m writing) but of course there are other differences amongst them. I’ll start with the ingredient lists. Between Dr. H. and Weleda, I have to declare a tie in terms of best smell (neither really has a taste). The smell of the Dr. H. balm is what got me hooked years ago: it smells of roses and something a bit herbal. Everon also smells of roses but it’s sweeter and mellower where Dr. H. is sharp. Nuxe is completely different than the other two, as it has a citrus smell and something else that I cannot quite identify. Possibly it’s a mix of the grapefruit and lemon oils that I smell the most. Dr H. and Weleda both become very smooth on the lips once applied. I think Dr H. actually stays on longer for me than Weleda does, but I still like Weleda enough to continue buying it. Dr. H. actually looks semi-glossy on the lips because of the natural oils. Back in my 20’s I often wore Dr. Hauschka balm and just minimal makeup, and felt like a rockstar. Nuxe is much thinner than the other two, possibly due to the higher percentage of oils and butters, and less wax, in this balm. It doesn’t provide a satisfying, thick, coating on the lips. It’s lighter all around, in terms of smell and presence. All three come in plastic swivel up tubes, with long caps that cover down to the base of the stick. Dr H. and Weleda come with a typical lip balm shaped application surface, while Nuxe comes with a very pointy lipstick shape. I also immediately broke the Nuxe balm when trying to apply it. I say Nuxe’s shape is a huge disadvantage and really turns me off. Especially because of the thinness of the balm itself, the pointy applicator surface works against me when I apply it. Hands down and without a second thought, I say Dr. H. and Weleda’s balms are amazing. They are certainly great for maintaining good lip condition and preventing wind burn and chapping from dry weather. I can also attest to the fact that both help heal (my) lips when they’re in poor condition. These two are so comforting to have around, with their delicious scent and easy application. Nuxe, again, stands out from the other two. Because it’s thinner and difficult for me to apply, I probably won’t carry it around with me. I most likely also won’t repurchase it. If I feel the need to use Nuxe lip balms, I’ll go back to the really thick stuff in the jar. I do want to note that none of this bunch contains sunscreen, if that’s a concern for you. In conclusion, I will continue to buy Dr. Hauschka and Weleda lip balms. I’m just happy to have an old favorite (Dr. H.) back in my life! I cannot believe I ever gave it up in the first place! As usual, I’d love to get your comments or anything else you’d care to write!